Parathas are homemade Indian flatbreads typically cooked daily to be enjoyed for breakfast, lunch or dinner. 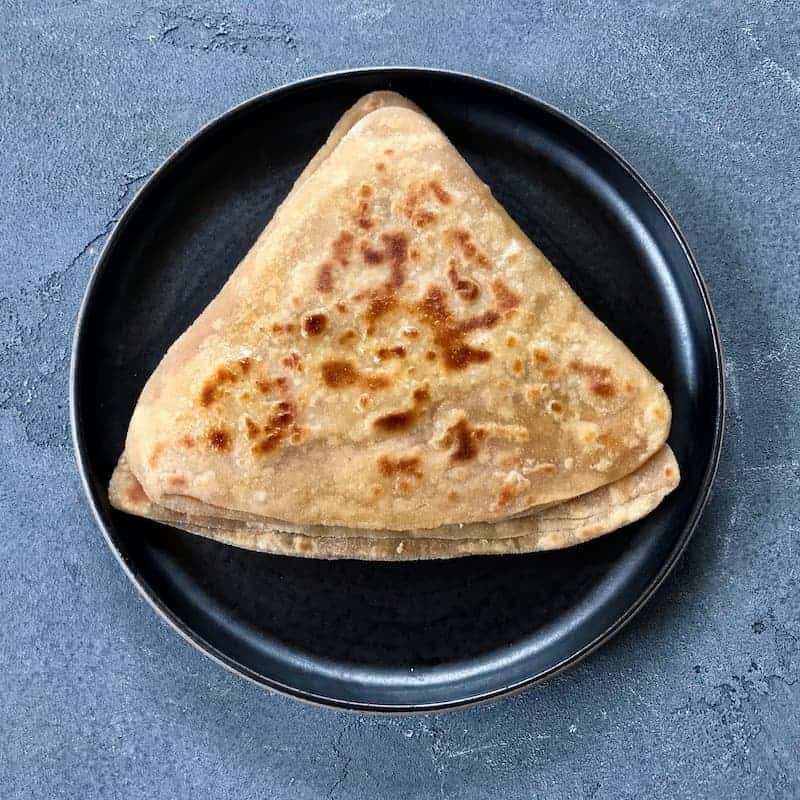 Parathas are made by layering and rolling dough that is then cooked on a hot griddle until it turns golden brown on both sides. They fill your kitchen with the wonderful aroma of freshly made breads with the ghee melting over. These rich, flaky flatbreads can be enjoyed with curries, daals, pickles, chutneys and also make a great accompaniment with a hot cup of chai. 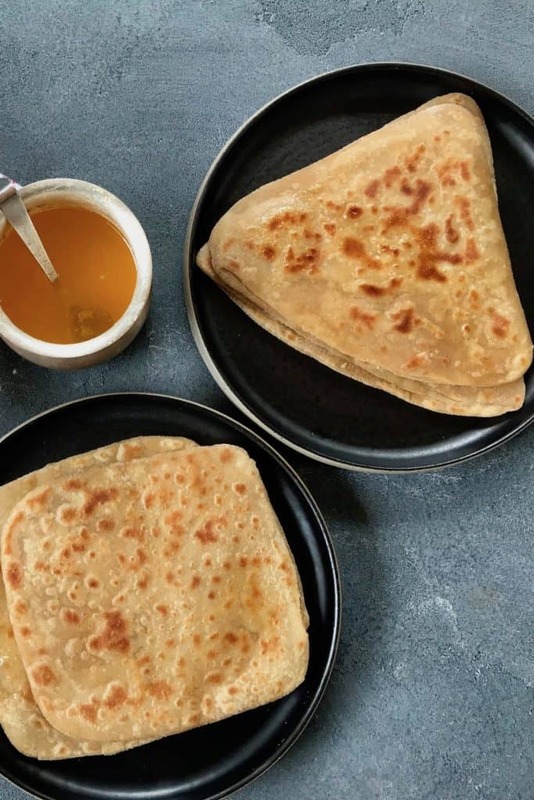 Parathas, staple in many Indian homes, are soft, thin, and flaky flatbread that can be eaten for breakfast lunch or dinner. Plain parathas are mainly made with whole wheat flour that is kneaded using salt, oil and water. 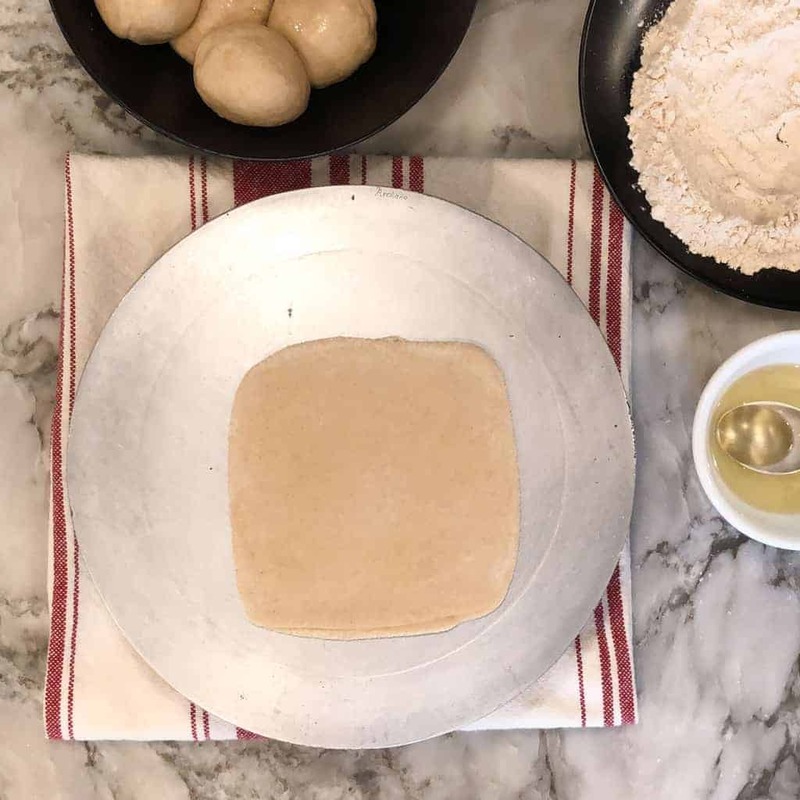 The dough is then rolled into layered and cooked on a hot griddle with some ghee or oil until both the sides get golden brown spots. Stuffed parathas on the other hand have combination of savory filling in them. Absolutely! Simply replace the ghee with any cooking oil and you have vegan version of the parathas. Parathas are made with finely ground whole wheat flour also known as Atta. The best place to buy the flour is usually an Indian grocery store. 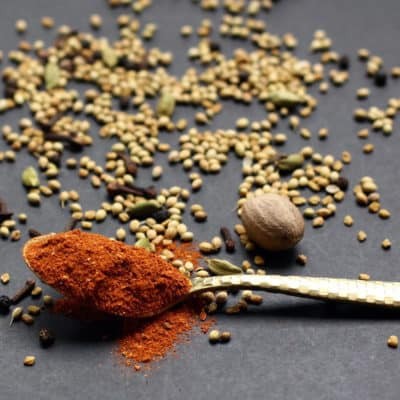 Some of my favorite whole wheat flour brands include – Aashirvaad Select Sharbati Atta, Sujata Chakki Atta, Aashirvaad Whole Wheat Atta and Golden temple Whole Wheat Atta. 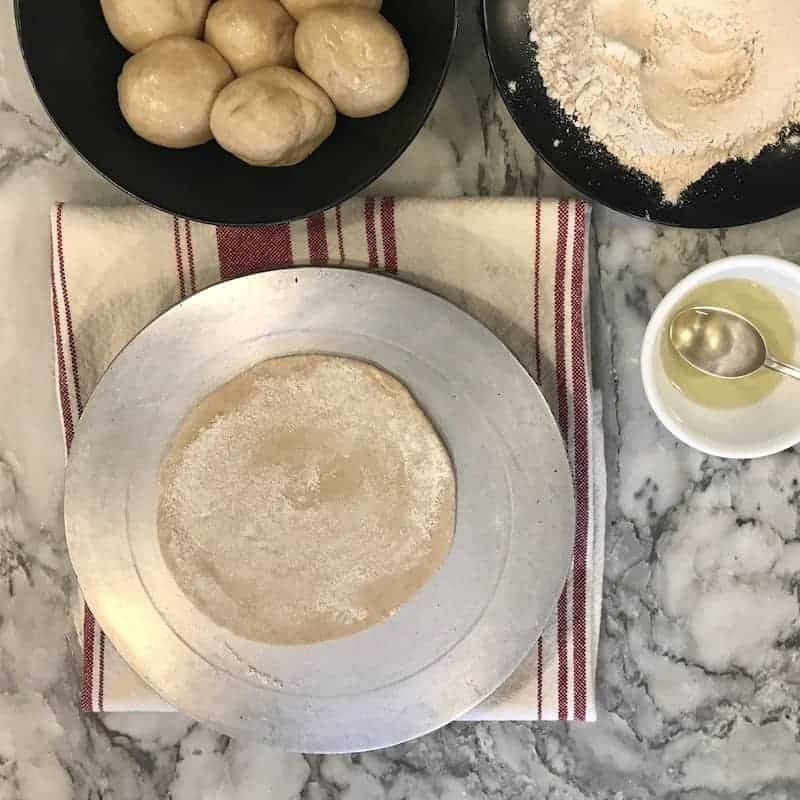 How to make the paratha dough? 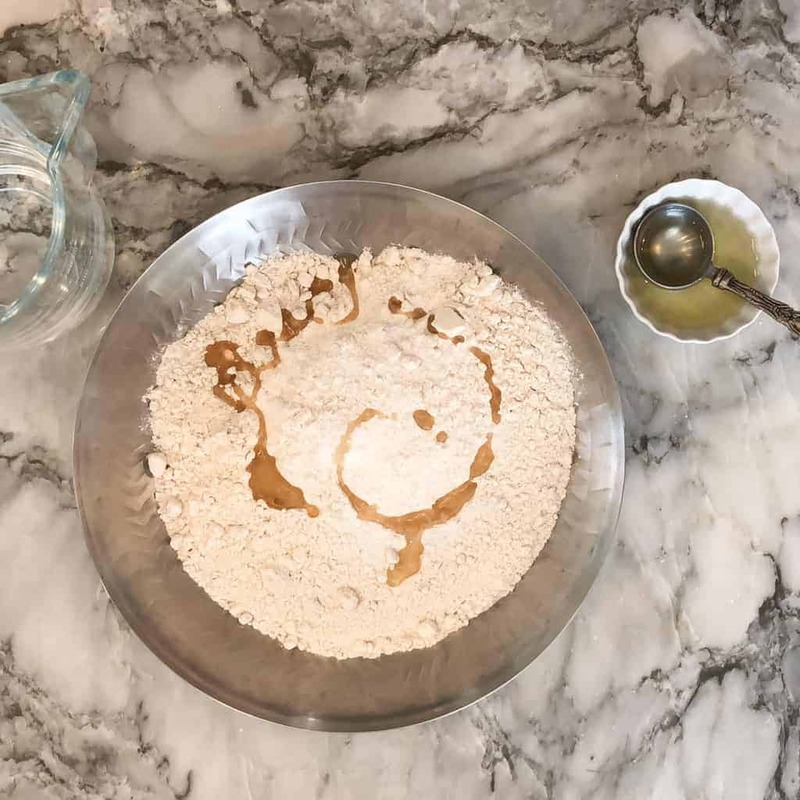 In a large bowl, mix 3 cups of flour, 1 teaspoon salt and 1 tablespoon oil. Slowly add water, little bit at a time, mixing with your hands until soft dough forms. Adding about 1 and 1/4 cup of water. Note: Depending on the brand of the flour you may need more or less water so only add little bit at a time. 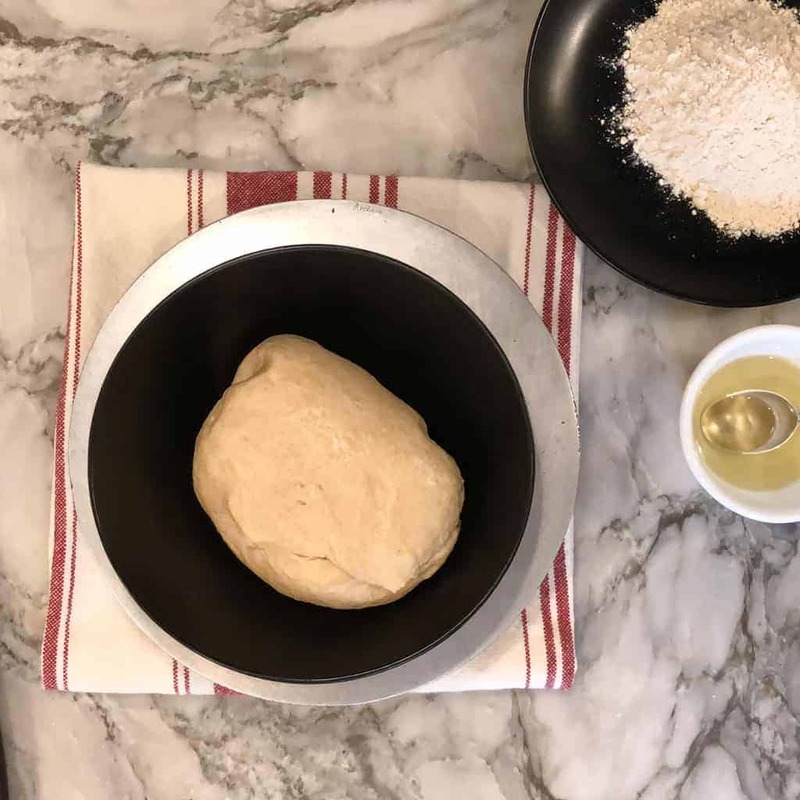 Add 1 tablespoon of oil to the dough and knead again until the dough is smooth. 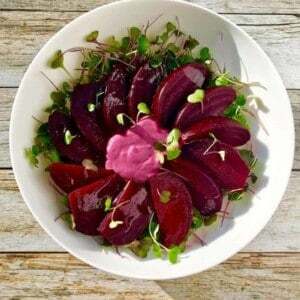 Allow to rest for 10 to 20 minutes covered with plastic wrap or in an airtight container. 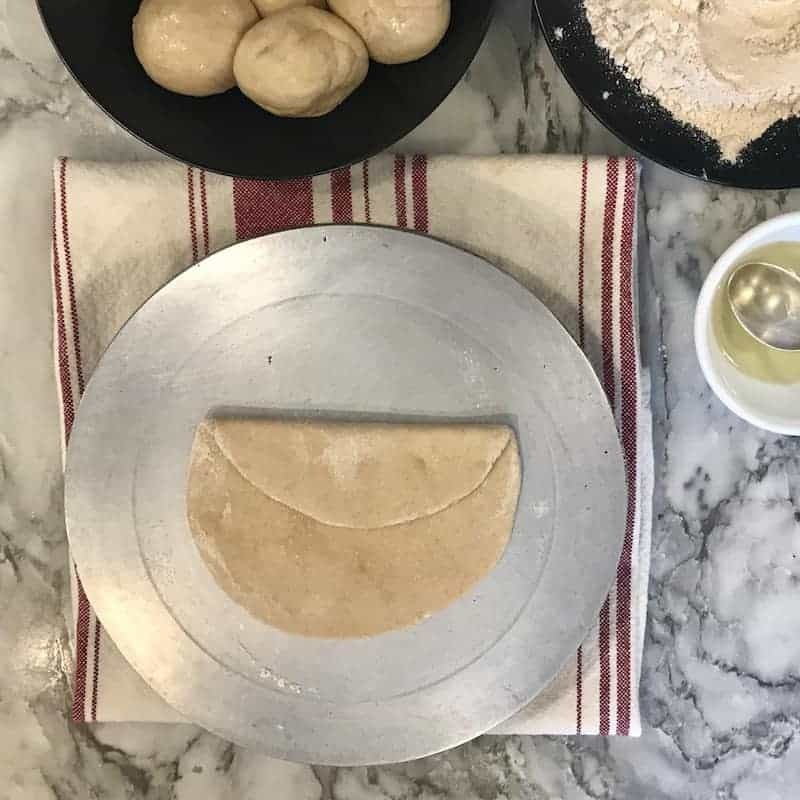 Divide the dough into ten pieces and roll each piece on the palm of your hands into a round ball. 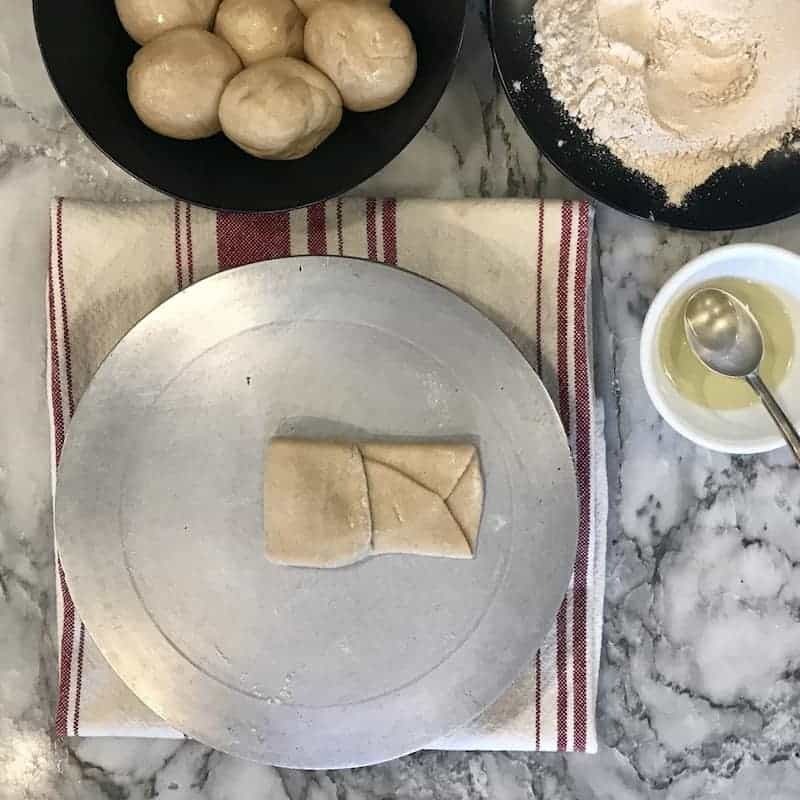 Take one piece of dough ball and roll it in the dry flour. 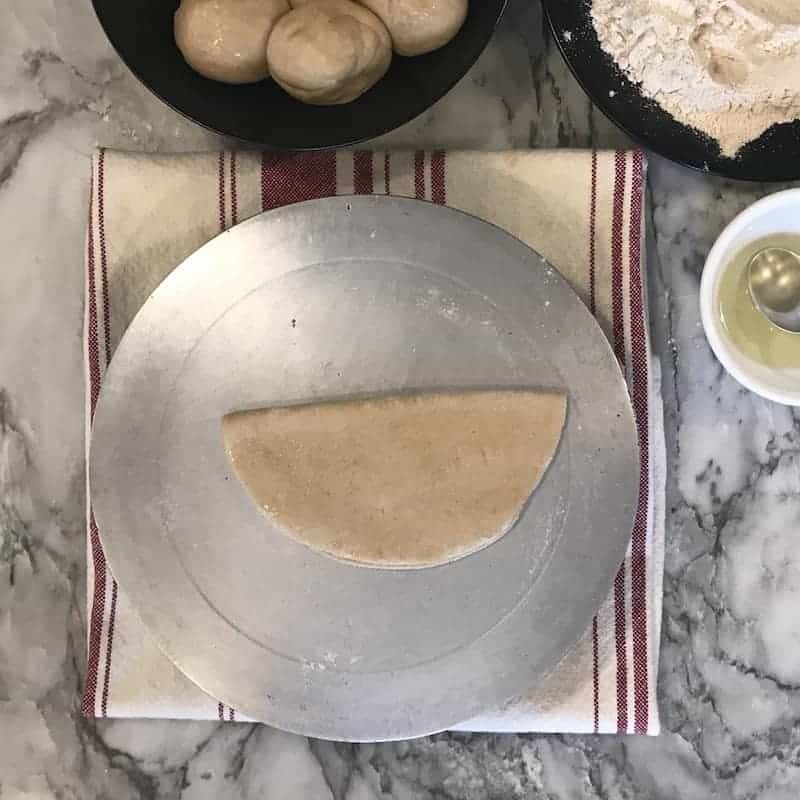 Using a rolling pin, roll the dough into a 4-inch circle. Dip one side of the circle into the flour. Drizzle the floured surface with few drops of oil, spread it evenly with your fingers. Fold top 1/3 side of the circle to the center. Fold bottom 1/3 side of the circle to the center. Drizzle the surface with few drops of oil, spread it evenly with your fingers and fold the left 1/3 side to the center and the right 1/3 side to the center. This will form a square shaped piece of dough layered with oil and flour. Dip the dough in the dry flour coating both the generously with flour. 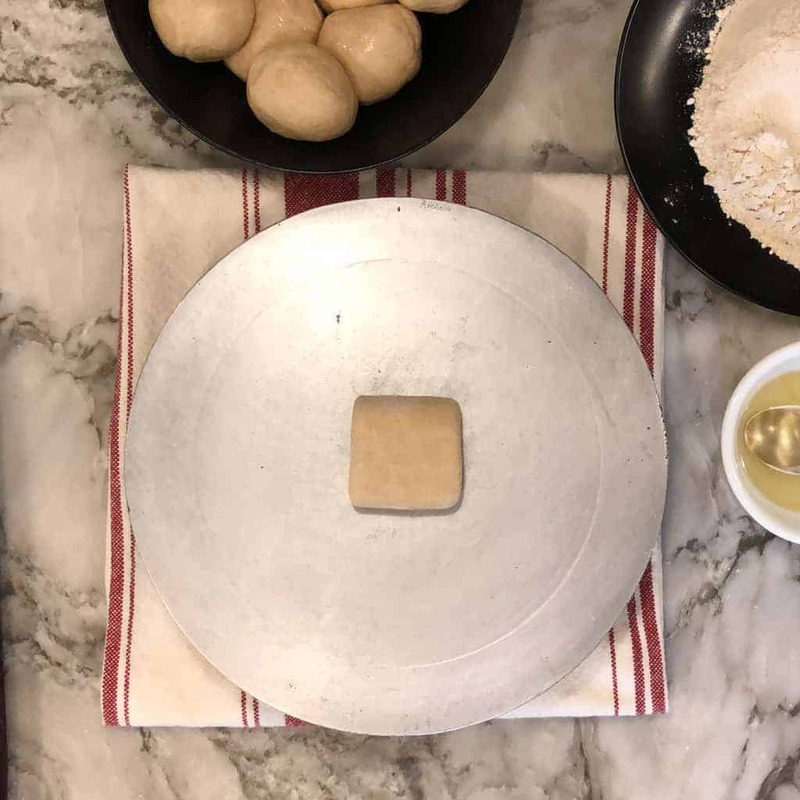 Roll the dough back and forth with the rolling pin as you maintain the square shape. Check the videos for more details on the rolling. 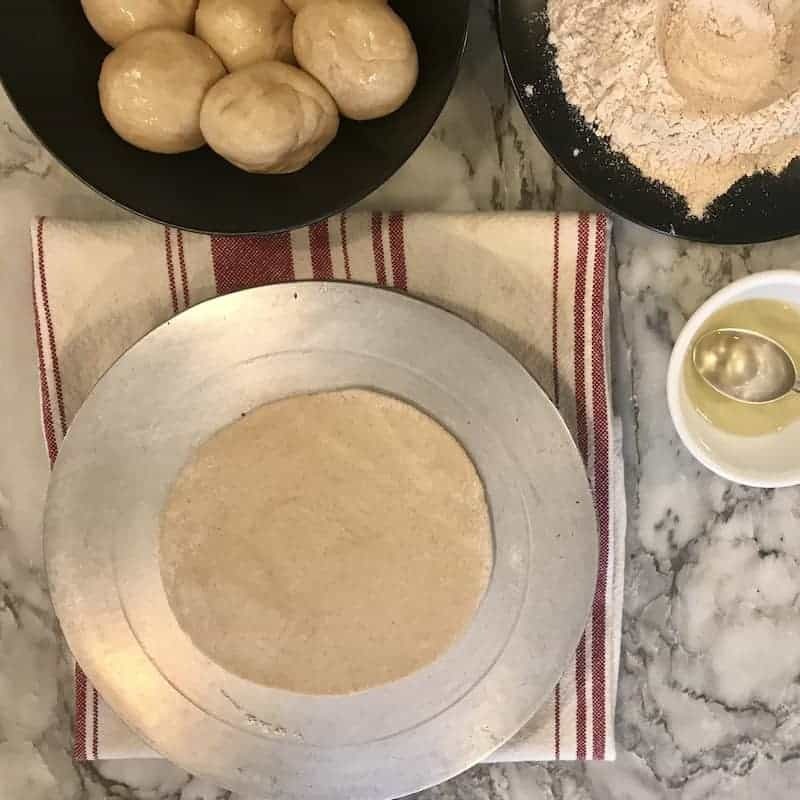 Take one piece of dough ball and roll it in the dry flour. 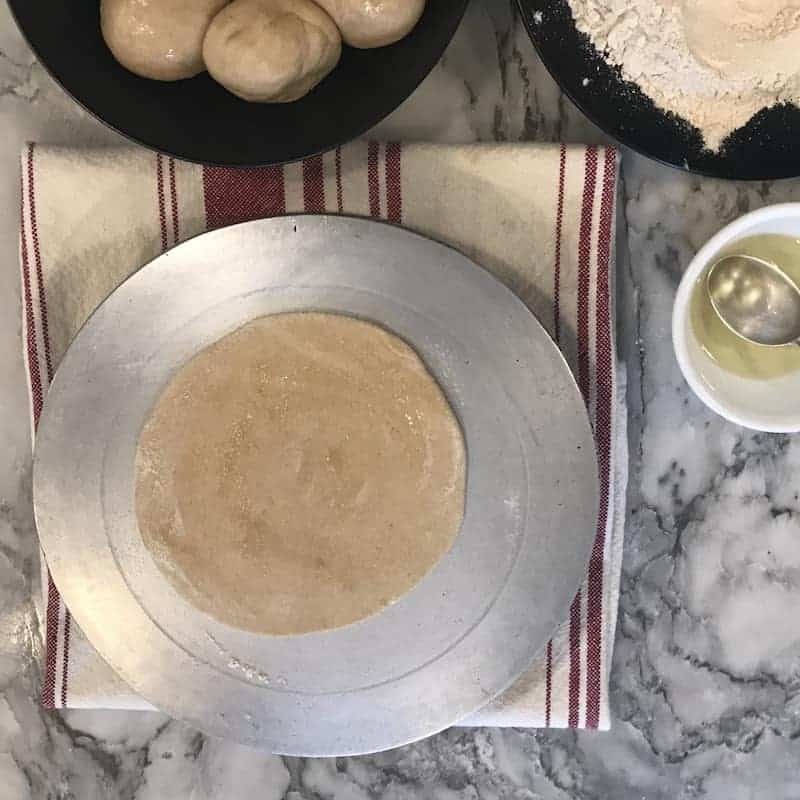 Using a rolling pin, roll the dough into a 6-inch circle. Dip one side of the circle into the flour. Drizzle the floured surface with few drops of oil, spread it evenly with your fingers. Fold the circle in half so that the oil is on the inside. Drizzle the surface with few drops of oil, spread it evenly with your fingers. 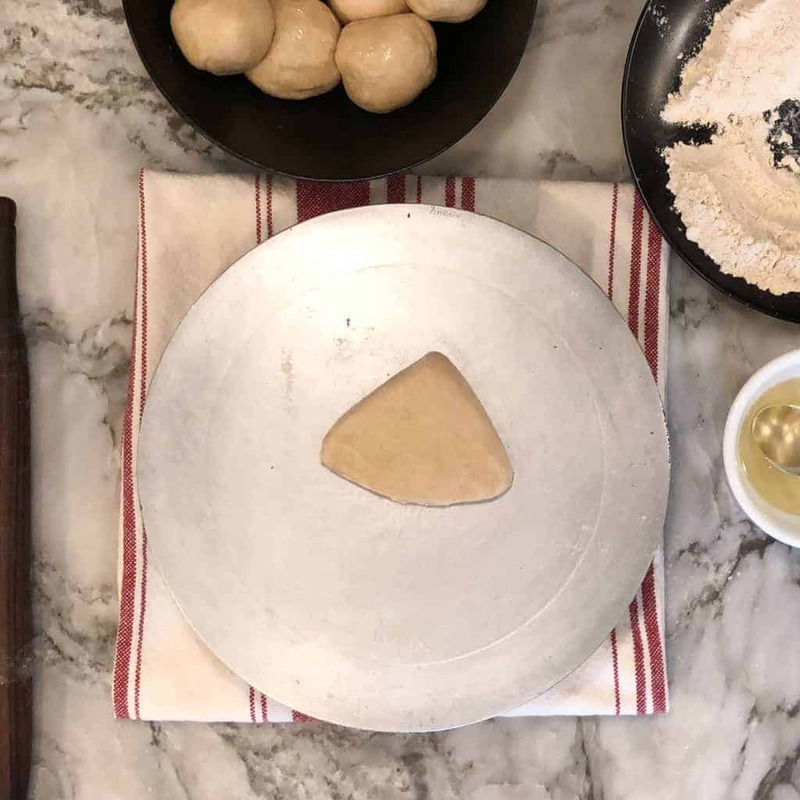 Fold the semicircle in half again to form a triangle shaped piece of dough layered with flour and oil. 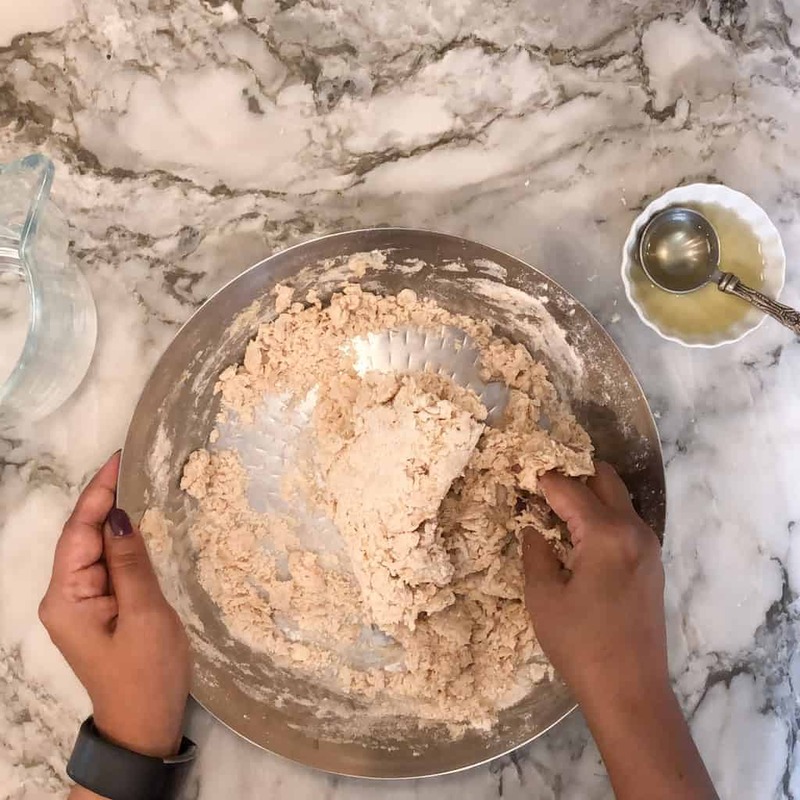 Dip the dough in the dry flour to generously coat both the sides. 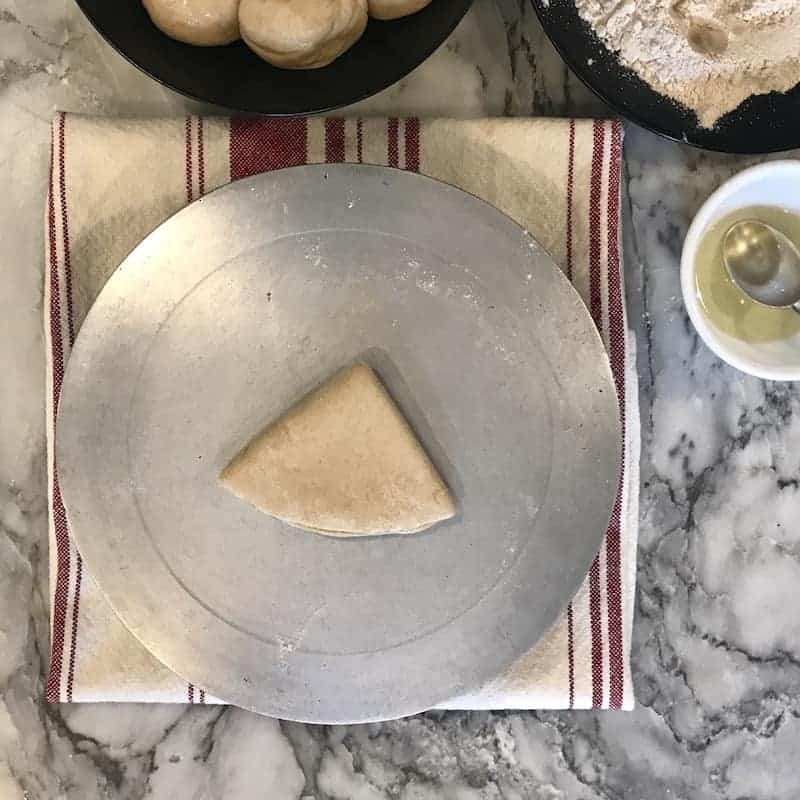 Roll the dough back and forth with the rolling pin as you maintain the triangle shape. Check the videos for more details on the rolling. Warm a griddle over medium-high heat. 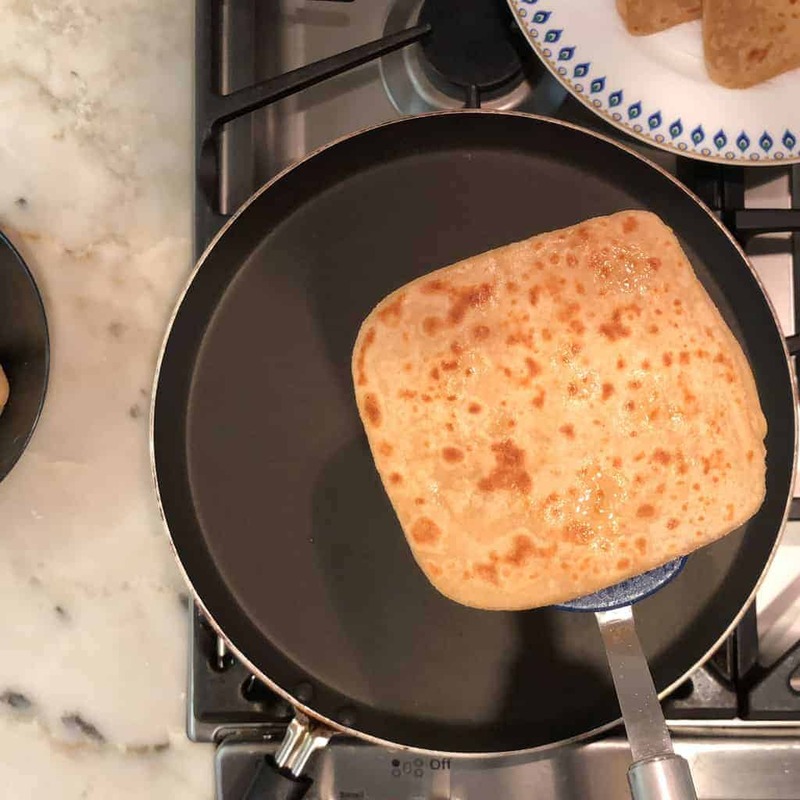 Once the griddle is hot, carefully place the rolled out paratha on the surface and cook until the bottom of the paratha turns lighter that the uncooked top, about 1 minute. 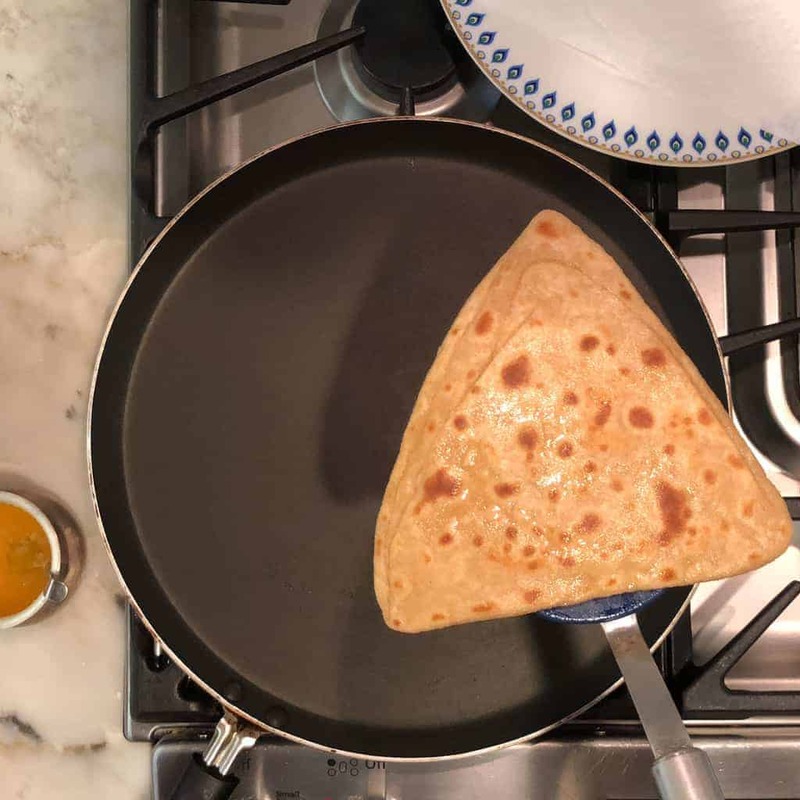 With a flat spatula, flip the paratha and top with 1/4 teaspoon of ghee, spreading it evenly over the surface with the back of the spoon. Cook the second side until it turns light brown, about 2 minutes. Flip the paratha and top with 1/4 teaspoon ghee, spreading it evenly over the surface. Cook until light brown, 1 to 2 minutes. Gently press the paratha with the spatula to help the paratha cook evenly; be sure to press gently for a soft, flaky paratha. Once both sides get spotty golden brown, transfer the paratha to a plate. Note: Please check the video for visual details. Repeat with the remaining dough pieces, oil, and ghee. While one paratha is cooking you can start to roll the next. Enjoy warm! Make sure the dough is not too hard or not too soft by adding little water at a time as needed. Knead the dough really well after adding the oil to make sure that the dough is lump free. Allow the dough to rest for 10 to 20 minutes. 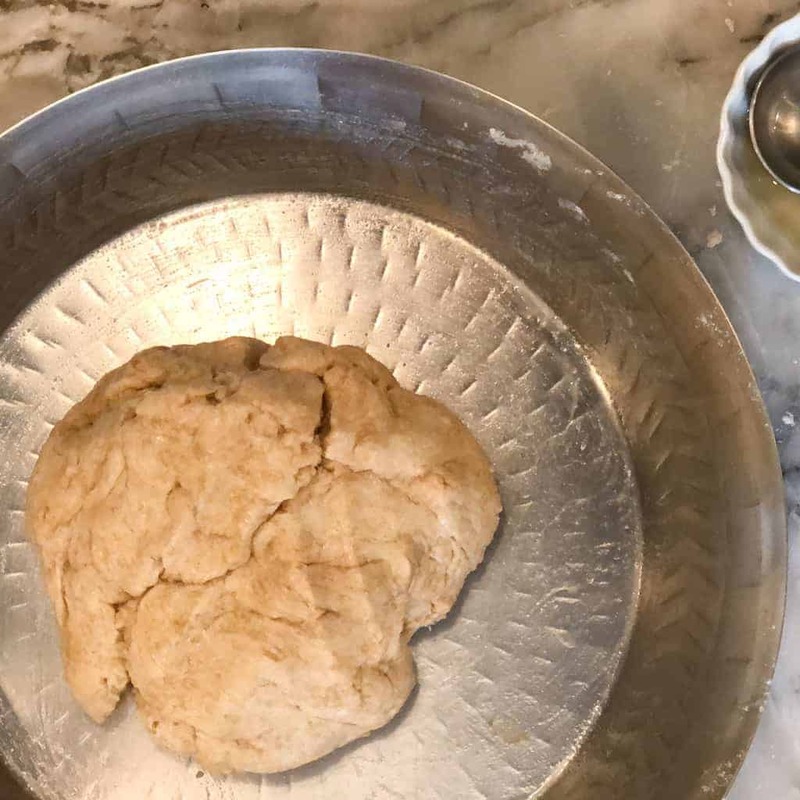 Cover the dough at this step to avoid it getting dry. Roll with light hands. Do not apply too much pressure. Cook by gently pressing the paratha on the sides with a flat spatula. Pressing it too much will cause the paratha to get tough. Apply ghee when the paratha is cooked half way through or when its almost fully cooked. 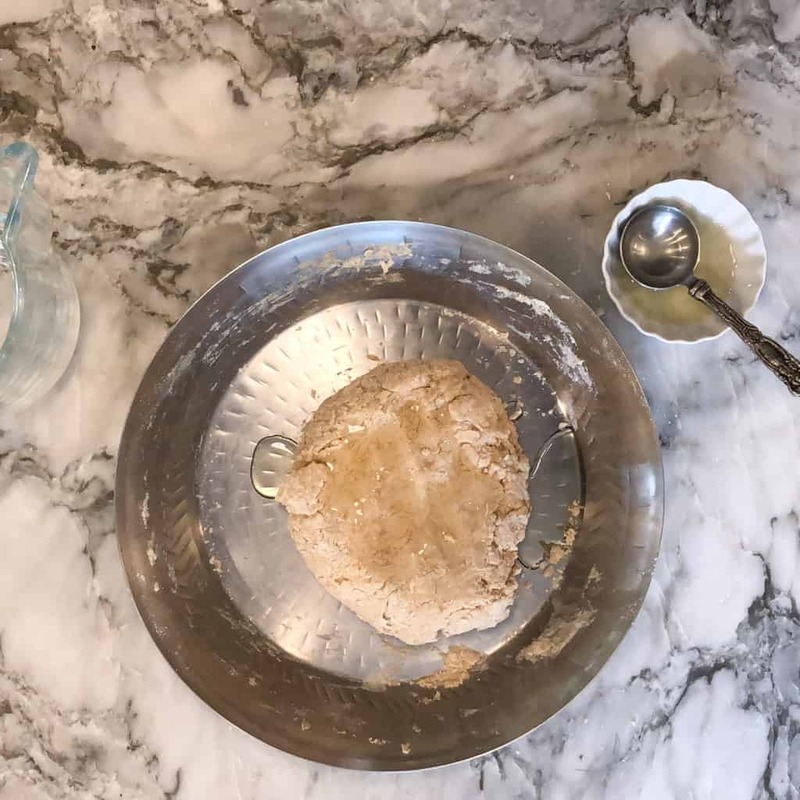 Dough can be refrigerated in an air tight container for up to 3 days. 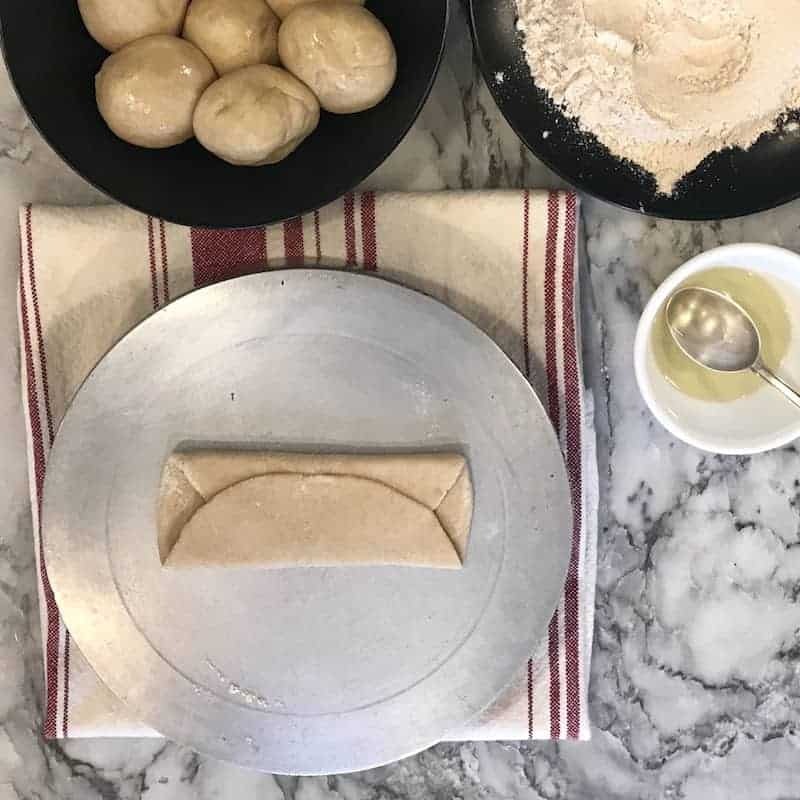 When using refrigerated dough, allow the dough to come to room temperature before rolling. 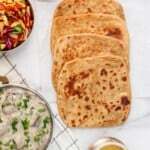 Cooked Parathas can be refrigerated for 3 to 4 days or frozen for a longer shelf life. Reheat the Parathas on stove top griddle with a sprinkle of oil or ghee. 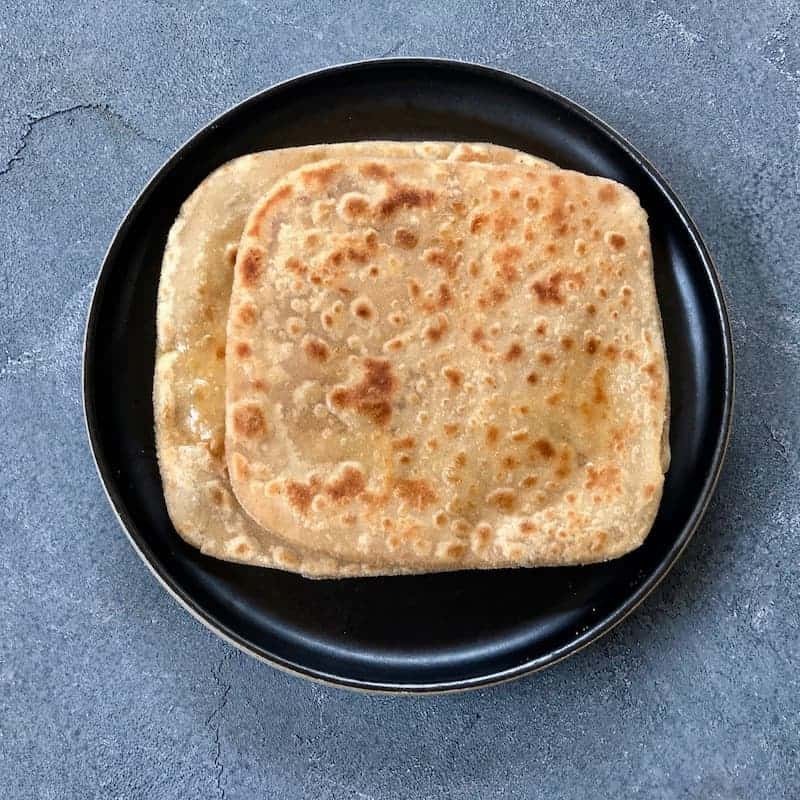 Parathas are everyday Indian flatbreads made by layering and rolling dough that is then cooked on a hot griddle until it turns golden brown on both sides. 1 1/4 cups water plus additional 2 to 3 tablespoons if needed. 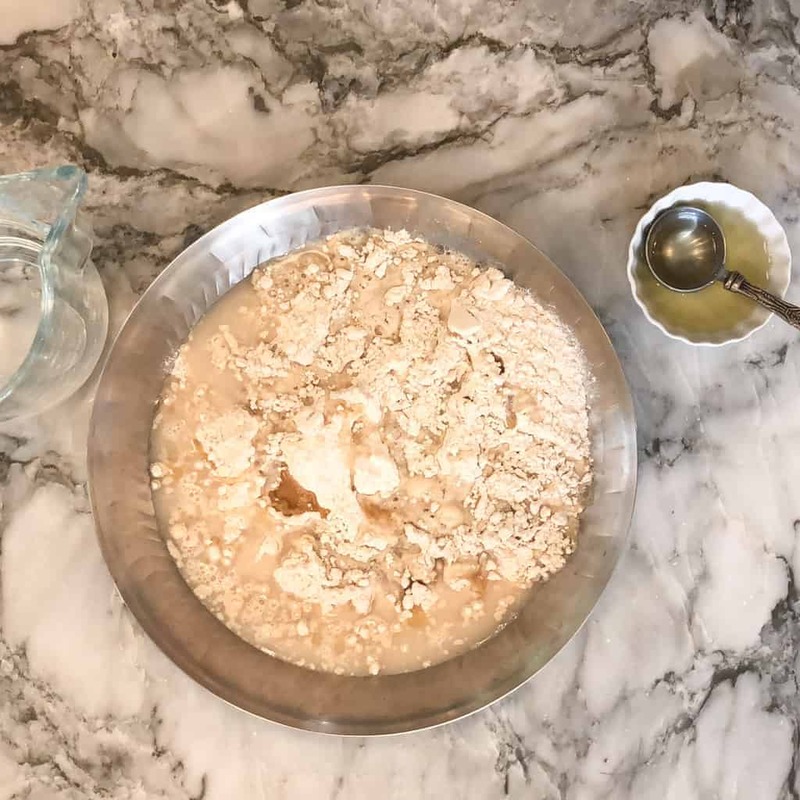 In a large bowl, mix 3 cups of flour, salt and 1 tablespoon oil. Slowly add water, little bit at a time, mixing with your hands until soft dough forms. Adding about 1 and 1/4 cup of water. Note: Depending on the brand of the flour you may need more or less water so only add little bit at a time. 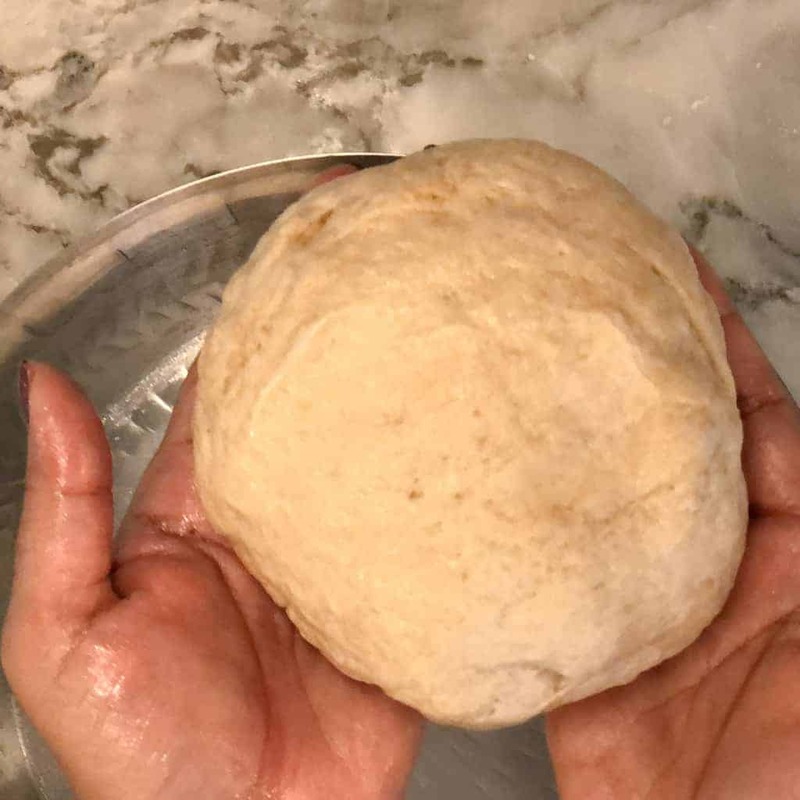 Divide the dough into 10 to 12 pieces and roll each piece on the palm of your hands into a round ball. 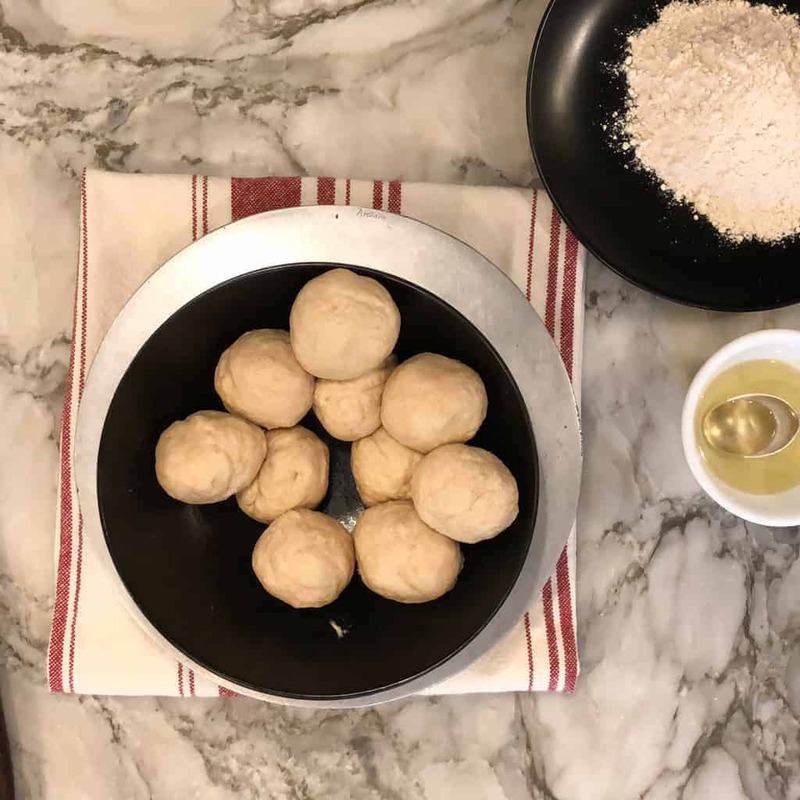 Take one piece of dough ball and roll it in the dry flour. 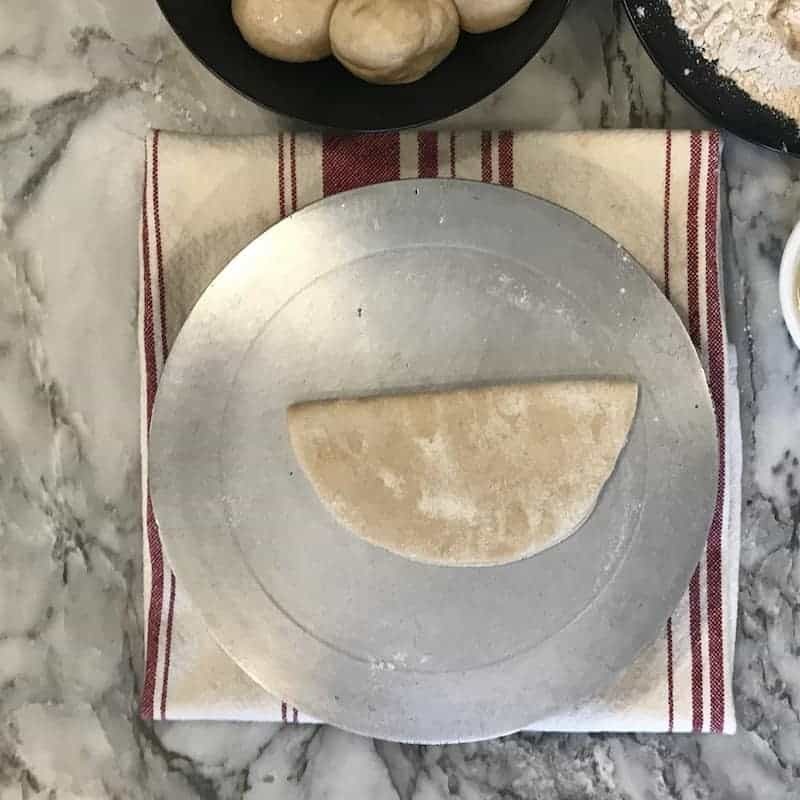 Using a rolling pin, roll the dough into a 6-inch circle. Dip one side of the circle into the flour. Drizzle the floured surface with few drops of oil, spread it evenly with your fingers. Fold the circle in half so that the oil is on the inside. Drizzle the surface with few drops of oil, spread it evenly with your fingers. 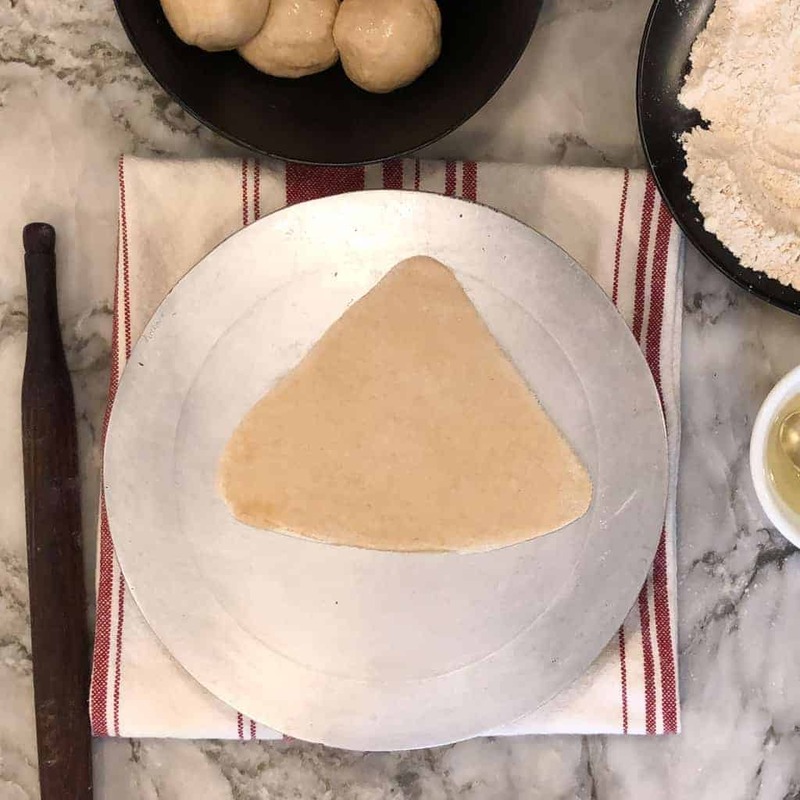 Fold the semicircle in half again to form a triangle shaped piece of dough layered with flour and oil. Flip the paratha and top with 1/4 teaspoon ghee, spreading it evenly over the surface. Cook until light brown, 1 to 2 minutes. Gently press the paratha with the spatula to help the paratha cook evenly; be sure to press gently for a soft, flaky paratha. Once both sides get spotty golden brown, transfer the paratha to a plate. Note: Please check the video for visual details. 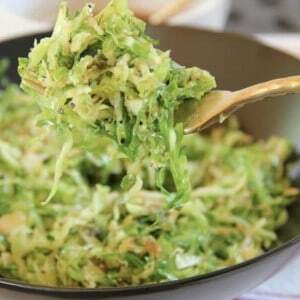 Substitute neutral vegetable oil for ghee. 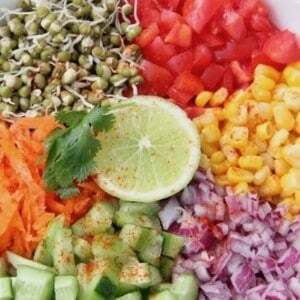 Great recipe Archana – I would be very happy living in a household where these were whipped up fresh daily! 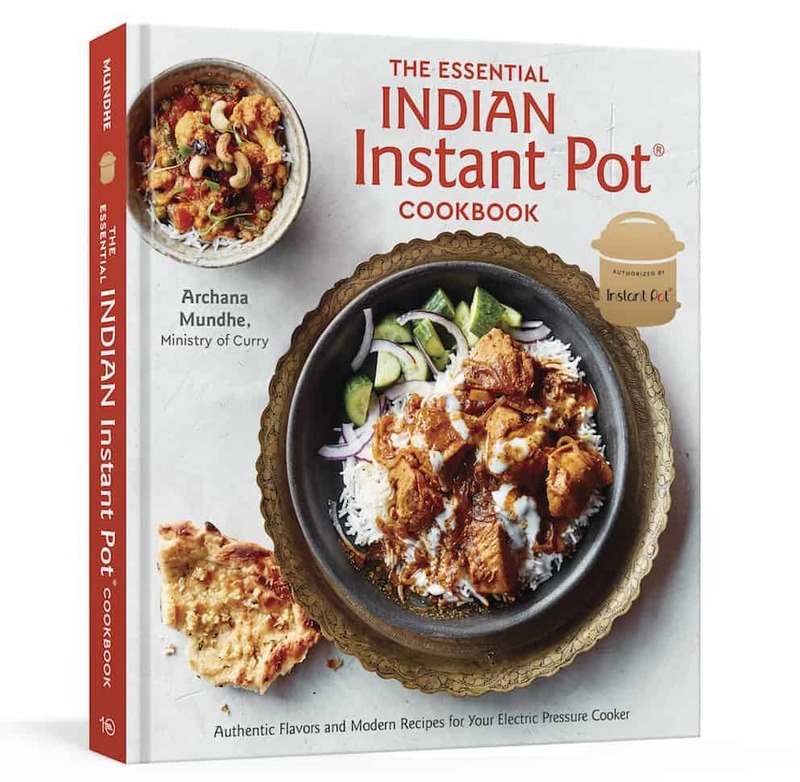 Congrats on your cookbook too – I have been following your posts on Instagram and you must be so proud! What type of oil do you use?And do you make your own ghee? 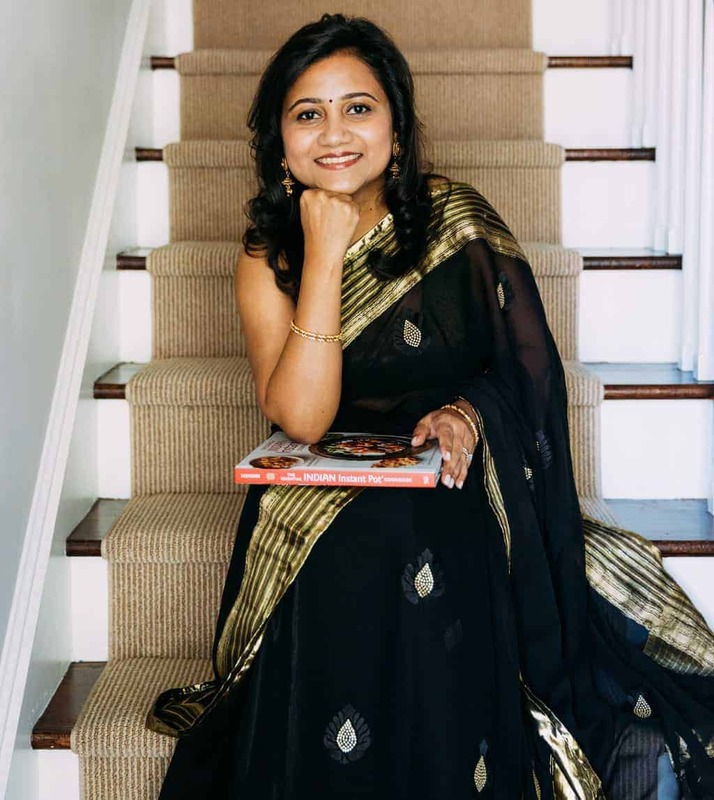 Hi Melodie, I use avocado oil and yes I make my own ghee. 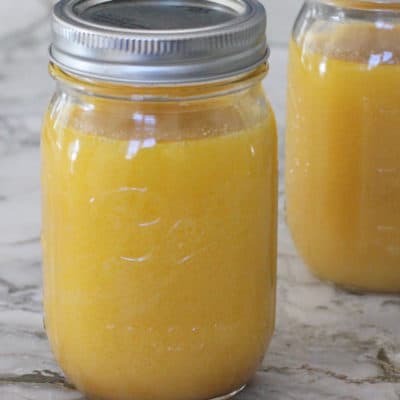 It is very easy, I have both stove top and Instant Pot recipes for ghee on the website. Looks fun and yummy! What is the tray you roll them out on called? I would like to find one.